L O C A T I O N, L O C A T I O N, L O C A T I O N! Le Carlyle a été présenté dans de nombreux films: Scarface, The Birdcage, Bad Boys 2, Random Hearts et Pronto. Luxueuse Suite 3C à l'Hôtel de renommée mondiale Carlyle situé au 1250 Ocean Drive sur le coin de la 13ème rue dans le coeur de South Beach à quelques pas de la plage. La suite 1100 sq. Ft. Est tout neuf, décoré avec goût et peut accueillir 4 personnes confortablement. Le Carlyle est situé sur un seul et unique Ocean Drive, la promenade la plus populaire de Miami. Si vous deviez visiter Miami sans prendre une promenade sur Ocean Drive, l'expérience juste ne serait pas complet. Lummus Park et une merveilleuse étendue de sable et la mer se trouvent d'un côté, tandis que l'autre brille avec une longue bande de bars, magasins, restaurants et hôtels. Jour et nuit, l'ambiance fiesta ne se fane jamais. Ocean Drive détient les plus beaux exemples de ce style qui évoque le romantisme et le glamour d'un autre temps. Pittoresque comme une carte postale et bourdonnant constamment avec énergie, Ocean Drive est un Miami South Beach à voir absolument. La cuisine a une gamme complète de haut des appareils en acier inoxydable de ligne, beau bar de petit-déjeuner de verre, la salle de bain a deux lavabos, bidet, une marche massive dans la douche, lit queen, grand lit dans la deuxième chambre, et un canapé dans le salon . Les autres caractéristiques comprennent une télévision LCD à écran plat avec le câble, l'accès Internet haute vitesse, lecteur CD / DVD, cafetière, micro-ondes, ustensiles de cuisine / plaques / argenterie, laveuse / sécheuse, draps et serviettes, climatisation centrale, fer à repasser, et concierge sur le personnel du site pour desservir tous vos besoins. Les taux de la célèbre hôtel d'à côté à partir de 450 $ + par nuit. Les taux que nous offrons sont phénoménaux! RESTAURANT AU Carlyle est maintenant ouvert !!! Just like the pics. Great location. Apartment was exactly as expected. 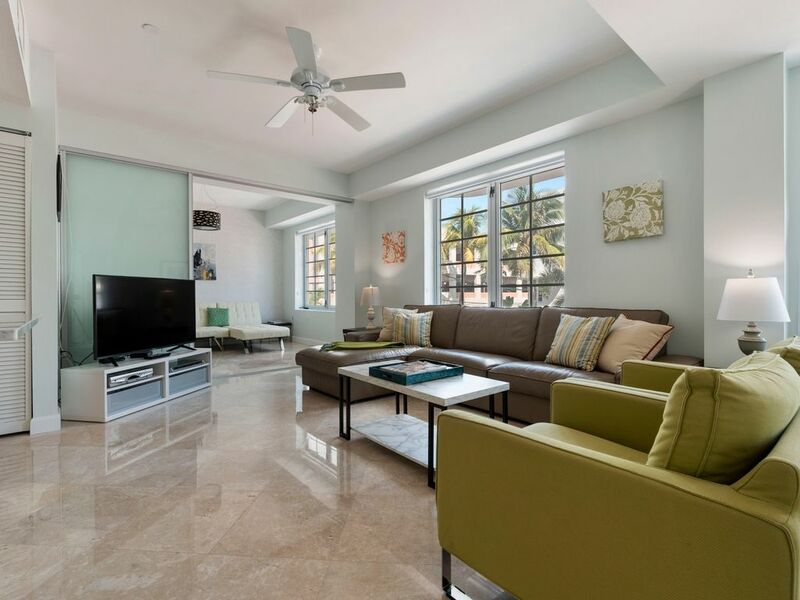 Location was amazing, located in the heart of South Beach directly across from the beach. Second bedroom had a very small convertible couch/futon; my husband and I just slept on the couch in the living room and it was incredibly comfortable. Perfect for a weekend with friends, but the setup might not be so great for 2 couples that want their own private bedrooms. 2 full bathrooms were great except the bathroom in the converted “second bedroom” has a barndoor which is aesthetically pleasing, but doesn’t give much privacy. The 24-hour Concierge wasn’t there all the time - we had to wait for about 20min for someone to show up when we were checking out. We left our luggage after checkout since we had a few hours to burn before heading to the airport, it was great so we didn’t have to lug it around with us to breakfast (they just had us leave it by the front desk - not in a locked closet or anything secure, but we didn’t mind). We were able to check-in early the day we arrived because the apt hadn’t been rented the day before - that was greatly appreciated. Overall, a great trip. We would definitely stay here again. I was very pleased with the process of reserving the apartment, communicating with the manager as the details regarding the trip were being hammered out, checking in, and, of course, the stay itself. Though the apartment is in the heart of SoBe right on Ocean Drive, it was surprisingly quiet (though I always travel with a white noise machine, which usually dampens any extraneous street noise). Speaking of the location, it was spectacular. Everything you'd want in SoBe is just a few blocks away. And it was kind of cool telling people we were staying at one of the filming locations for "The Birdcage." We found it helpful to have a full kitchen and washer and dryer. The sofa in the living area was comfy and the bed in the main bedroom was also comfortable. The guests who stayed in the leather convertible sofa room noted, however, that it was not very comfortable. I would strongly advise the management to invest in a memory foam topper to pop on top of the converted sofa, and I suspect that issue would be taken care of. Throughout the stay, the manager answered questions by text or email within minutes, and he was very flexible with the check-out process. Something always seems to go wrong on away vacations like this, but I can honestly say that this one went totally smoothly. All of us in the group agreed that we would reserve the apartment again in a heartbeat. If you're considering this property, don't hesitate. You won't regret it! was arranged well with a nice flat screen TV. The owner of the unit was also easy to deal with. The negatives... 3 easy ones stand out I think a TV in the master would have been nice and there were no wash rags at all, which we thought was weird. Also the lighting overall wasn’t the best and the 2 bedside lights in master were really dim. Lastly let me just say the bedroom layout for the second bedroom is odd. I don’t believe this condo is that well suited for 2 couples as likely one person would end up on the couch. The second bed is a futon type thing that folds out. Our son slept on the couch so for our family of 3 it wasn’t an issue. The couch was large and comfortable. Again overall positive experience, but it’s a quirky sleeping arrangement for, 2 couples in our opinion. Really can’t say enough about how great the on-site staff was. And yes if the 3 of us went again we would consider the unit. The concierge personnel were amazing. Upon arriving the a/c was broken and Kim went above an beyond to have a tech come out that night and fix the air. There was a small roach problem, but they provided bug spray. The downstairs cafe has awesome food... washer and dryer were also a perk. There was a decent assortment of cookware as well provided. We had a great stay and no complaints whatsoever. Everything we needed within walking distance. Should we ever return to South Beach, this is the place we would stay. Great staff, amazing condo and the best location on South Beach. We will definitely be back. Our experience was amazing. Someone was there to assist with everything. We couldnt ask for a better place.